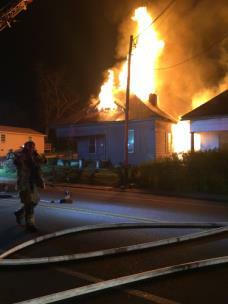 Shortly after 11 p.m. on Saturday, Chattanooga firefighters responded to a report of a house fire on Dodson Avenue. Firefighters with Engine 5 were the first on the scene. 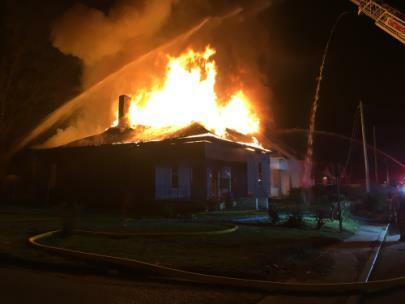 Captain Joey Smith said two houses at 610 and 612 Dodson Ave. were engulfed in flames on the backside of the structures, and the flames were spreading quickly. 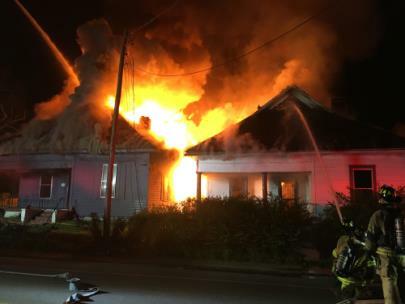 Captain Smith said they took hand-held hoselines and made entry into one of the houses to look for victims and begin putting the fire out, but by then, flames had broken through the roof and they were ordered out of the structure for their own safety. A second alarm was requested to bring in additional firefighters and equipment. Battalion Chief Ashley May said the firefighters fought the fire defensively, using hand-held hoselines and master streams from aerials above to keep the fire from spreading any further. Chief May said it took 40 firefighters roughly an hour to get the blaze under control. No one was found inside the houses and no injuries were reported. The firefighters were told by property owners that both houses had been vacant for some time. With 10 CFD fire companies committed to this fire, mutual aid assistance was requested to help cover the city. The East Ridge Fire Department sent a pumper to the CFD's Station 5, and the Red Bank and Signal Mountain fire departments sent apparatus to the CFD's Station 1, ready to respond if called upon. Chattanooga Police, Hamilton County EMS and Chattanooga-Hamilton County Rescue also provided valuable assistance on the scene.